Sure, receiving things is nice. But did you know that often times, the BEST gifts are those that allow you to create memories with your loved ones? 1) People who have something to look forward to live longer (even when they’re ill). 2) People who purposely schedule things to look forward to are happier. So, with all of these benefits, why not give the gift of an experience? After all, wouldn’t YOU like to receive it? Sure you would…. so let me share some gift ideas that are ideal not only for this Holiday Season but all year long. What’s really convenient about these gift ideas is that many of them you can get online, and if you’re worried about getting them in time for Christmas, they are things that you can get in a day by running a couple of errands. One family experience that is bound to delight ALL family members regardless of their age is precisely a trip to Disneyland. I’m writing a book on how to make the most of this trip. You’ll be informed about it in the future. Depending on the interests of your gift recipient, you can buy museum passes. These can especially be fun if you buy annual kid museum passes. If there is something that can bring even the most distant and dysfunctional families close or the close and super-cool families close, it’s board games. I like open-ended questions. However, there’s something that you have to be aware of, and that is that with open-ended questions, the answers are open ended and there’s no predicting the outrageous things people can say. And the more outrageous your family is, the more non-PG the game can get. So keep the age recommendations in mind. Me? I love these games because they de-stress me. They make me have moments of introspection, they allow me to get to know the people I play with more and they allow me to hone my intuition. It’s relaxing because you’re not competing when it comes to knowledge (like trivia), but rather you’re going by knowledge of those that you’re playing with and mostly, your intuition. This game has provided us with hours of fun and lots of laughter. It’s for 4 to 6 players 12 years and up. I was thrilled when I saw that there’s a new version!! It’s a 2015 version. What is something you only need one of? What word would people never use to describe you? If you already have this version you might consider other versions as well, such as Party, Junior, On the Go or if you’re suuuuper brave, the Parenting 101 or Political Party editions. Personally, I would recommend you keep it light and that you stick to the original versions. They’re super fun! It’s recommended for ages 12 and up. Have you ever wished you could read your family members’ or friends’ minds to know what they think of you? Well, that’s a dumb question, right? I think that playing board games can be quite revealing, especially when it comes to Imagine If especially with its questions that pertain to you. Imagine if ____ (you) was a car. What car would ____(you) be? It would be interesting to find the answers, right? It’s recommended for ages 14 and up. There’s some questions that are a little racy so it’s best if you stick to these recommendations. It’s for 3 to 8 players. This game is a twist on Who Said What. The age recommendation is 14 years old and older. This game is for 4 or more players. I’ve played the older version. But there’s a newer Cranium version that might be checking out especially if you have played Cranium quite a bit. If you feel like really reminiscing and treasuring how your family got started, you can take a trip to where you and your loved one met (especially if it was in another city, state or better yet, country). You can go alone as a couple, or hopefully with the kids. Going there with the new members of your family will give that place even more meaning. If you have ever been in debt you can just imagine the relief you’ll feel knowing that at least one debt has been taken care of. This is the gift of peace and enhanced financial security. It’s best to accompany this gift with a small gift so that the Christmas isn’t necessarily gift-less. If you haven’t heard of Thrive Market and you love to eat healthy and wholesome foods you’re in for a HUGE treat. Thrive Market is a cross between Costco (since it’s a paid membership site- $59.95 is the annual cost) and Trader Joe’s. Orders over $49.00 ship for free. You can spend $25.00 for free on Thrive Market by clicking this special link which will also allow you to try Thrive market for free for 30 days. And if you’re concerned about how expensive these items might be, don’t worry. The healthy and often well-known products at Thrive Market are on average 35% less than they would be in retail, although the savings themselves can be anywhere between 25%-50% off retail. And as if that weren’t enough for every paid Thrive membership, Thrive donates an annual membership to a low-income family. Amazon is a convenient, awesome, and fast way to shop. I totally recommend it. If you’re unsure, and haven’t used your free trial before, you can test out the service for a month to see how you like it. Are you the type of Amazon shopper who waits until you have at least $35.00 worth of items in your shopping cart before you order your Amazon products just to get free shipping? With Amazon Prime, you don’t have to do that. You can order items with the Prime logo (there are more than 20 million eligible items) in their description as you need them and still get FREE two-day shipping. Plus, you can watch thousands of movies and TV shows with the Prime logo on Prime Video on your TV, laptop, Fire TV, Kindle Fire or smartphone. With Prime Music, you can listen to over a million songs and hundreds of playlists, ad-free. With Prime Photos, you can have unlimited photo storage on the Amazon Cloud Drive. You can access them from any of your devices regardless of where you are with an internet connection. Get early access to shop Amazon Lightning Deals which are often sold out before they become available to the general public. Read over 800,000 ebooks for free! The Kindle Owner’s Lending Library has New York Times best sellers, classics, fiction and non-fiction books that you can browse through to select your one book per month. It has no due dates. Prime is so much more than just 2-day free shipping, right? Especially when you can share this Prime membership including the free shipping with members of your household. So by giving someone in your home this gift, it is likely that you’ll get this gift to. Allows you to watch Netflix on 1 screen at the same time. Offers HD and you can watch Netflix on up to 2 screens at the same time. Premium is $11.99 a month. Offers HD, ultra HD and you can watch Netflix on up to 4 screens at the same time. And don’t forget, that you can try a Netflix for 1 month. Even though I’ve already mentioned Apple TV in a prior post it’s worth a mention again because you’ll be able to watch shows, movies, family pictures and listen to music as a family. I know this is a BBIIIIGGG commitment. But if you’re committed to loving a pet, that pet can in turn provide you with lots of joy. I have a golden lab that I adopted. And while I didn’t get her in Christmas, she’s given me so much and my son loves her so much to the point that sometimes, I think he’s her favorite toy. But please, consider adopting before any other method of acquiring a pet. We’re a photo-obsessed world, that’s for sure. Buuuut the one of the most popular forms of photos are called “selfies” not “welies.” And while yessss people can take a selfie with part of their family in the photo… it’s not likely that that photo will become a treasured photo to place above the mantlepiece or make it to the heirloom photobook. So instead of just taking a photo session for the Christmas picture, take a family portrait because you want to, when you want to, where you want to. And do it often so that you can literally all be in the picture. And remember, you can take a photo in your hometown, while on vacation or in a special and bigger family reunion. We’ll never regret having better photo quality prints, but we’ll always regret our photos not being of better quality. So every couple of years, upgrade your camera to something that is worthy of the time that you spend together with your family. Consider your budget and your needs. But above all, either read the manual or pay to learn how to use your camera really well. For this to be super effective create a list of the top 3 singers for each of your loved ones, that way you will be sure to delight. Then, subscribe to a newsletter like Ticketmaster to be notified when artists will be visiting your area. The gift of education is priceless. You can get your loved one a class that you know that is right up their alley, but in order to do that you really need to know them well. a cooking class (who doesn’t need to up their game in this department? Keep in mind that these classes can either be local/live classes OR they can be online. You can find a big array of online classes on Udemy.com. If you know someone who likes or loves cooking and is open to trying new food and/or recipes, perhaps an ideal gift for them would be a visit to meal preparation sites. One example that you can find out if they have a store in your state is Dream Dinners. The benefit of going to an location like this is that once you determine what meals you’d like to prepare for your family from a changing monthly menu that you can select online, you don’t have to do all the work that menu planning entails. Furthermore, you have less mess in your kitchen. With each order, you have a 36 meal serving minimum. And you get to chose whether you assemble 3-servings or 6-servings for each meal. However, for first time guests who are unsure if they’d like this process, there is an introductory offer that you can buy for yourself or for someone else that consists of 18 servings for $74.85. Once you’ve identified what meals you want and how many of each you’d like to prepare, you go to your nearest Dream Dinners store location for a meal assembly session with boxes or coolers to bring your uncooked meals home and freeze them. At each store you’ll have knowledgeable staff on hand on-hand to explain the process. You pay for your session online. In order to elegantly give this gift, there are Dream Dinners gift cards available. These can even be delivered electronically. You can select amounts between $25.00 to $500.00. One important thing to keep in mind is to buy a gift card that can handle 36 meal servings so that your recipient doesn’t have to pay out of pocket. If your loved one really likes audiobooks, they’ll love an Audible Membership. With more than 180,000 titles to choose from, Audible is the world’s largest provider of audiobooks and premium spoken word programming. AND their enjoyment is guaranteed because with every book you buy, you’ll get a Great Listen Guarantee that allows you to exchange a book that didn’t meet your expectations. How’s that for satisfaction? The best thing is that it’s really easy to purchase a membership for them. You get one audiobook per month for $14.95 per month. Your books are yours to keep even if you cancel. If you prefer, you can also buy a single Audible audio book. If your loved ones also enjoys the process of reading, there are more than 70,000 Audible titles (out of the 180,000 titles) that allow you to switch seamlessly between reading your Kindle version and listening, without losing your place, on Kindle app and Fire devices. If you know of anybody who is really into personal development, you can gift them a Hay House Radio subscription (which is actually free), but if you sign up for a Wisdom Community Membership, they’ll get additional benefits, like commercial-free Hay House Radio episodes and access to thousands of previously recorded episodes. They’ll need to sign up for a Hay House Account. But they can extend their membership a little bit longer by subscribing to a free trial. As we all know, putting up a Christmas tree puts us into the Christmas spirit. And in y opinion, not waiting until the last minute to put it up helps tremendously. Buy a gift for your child every Christmas. You can give it to them before putting up the Christmas tree, put it in their stocking or give it to them as a Christmas Gift. You can make Christmas tree ornaments (and although I’m all for creativity… the ornaments they “make” when they’re months old or one year old most likely won’t be all that great). You can take the kids Christmas shopping so that they can pick out their own Christmas ornament. Accumulating these ornaments and putting them on the Christmas tree either that year or the years that follow will become increasingly special. Best of all, when the kids are ready to fly on their own and move out of the house you’ll be able to give them their ornaments to put on their own tree (hopefully they had good taste 😉 ). (Please note: Be sure to label the ornaments or have a reliable way of tracking which ornaments belong to whom if you have multiple kids). Imagine if you had ornaments that you started collecting since your first Christmas, wouldn’t that be a total treasure? I had mentioned this in my gift guide for kids, but it’s an experience that kids really enjoy and therefore, it’s worth mentioning again. In case you’re wondering, the price for buying the subscription via Amazon is the same as if you visited the Highlights website. Facial, pedicure, manicure you name it. Even a couple of services are heavenly from time to time. She can be queen for the day and choose what she would like. You can purchase season tickets (or at least a pair of tickets) to see his favorite sports team. You’re bound to really surprise him if you get him tickets to see an entertainer, a comedian or a singer that he really enjoys. You can buy tickets to the movie he’s been wanting to see or give a voucher for him to choose the date or time when he wants to go. Who doesn’t want to call the shots for a day. Be the king, so to speak. Do you have suggestion for a great experience gift? What’s the best experience some has gifted you? 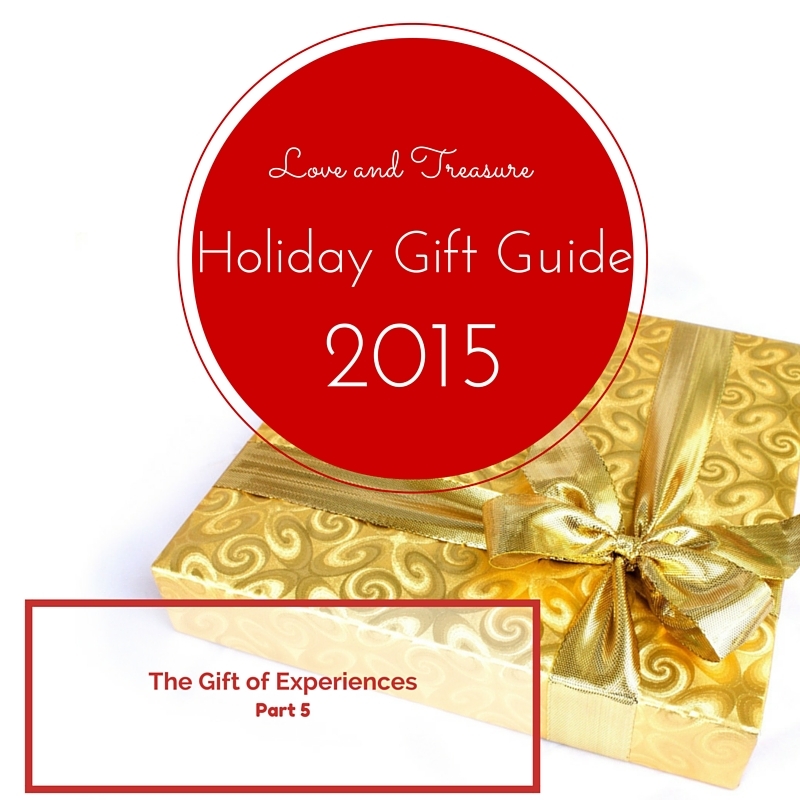 Love and Treasure Holiday Gift Guide 2015 Part 4 that gave you some obvious gift ideas that will be greatly appreciated by the recipient. And, like I said last time, even if you dislike all of my gift ideas (which I hope you don’t ) , or you want to buy a few or all of your gifts on Amazon that you had already thought out and planned to give, since I am an Amazon affiliate, feel free to use this link to do all of your Holiday shopping and purchases year-round… and you’ll be supporting this blog in the process, something that I totally appreciate).